We are available to accommodate all your valet parking needs. We offer trained, uniformed valet parking attendants for private and corporate functions such as Weddings, Baptisms, Anniversaries, Quinceaneras, Bah mitzvahs, Bar mitzvahs, Open houses, Fundraisers, Fashion shows, Grand openings, etc. 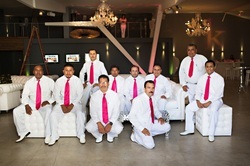 The number of attendants needed will be based on a few factors like, how many guests are you expecting, the type of event, what the parking situation is like, and the arrival of guests.Valet parking can be offered because the difficulty in parking in a congested commercial or residential area or just to dress up your event. What better way to set the tone of your event than by offering a convenient parking solution that adds a touch of elegance to any event. We are available throughout all of Southern California from Buellton all the way down to San Diego. FUNDRAISER: At AA Valet, Inc. we feel it is important to give back to the community. One of the ways we give back to the community is by offering a 10% discount to all fundraising events, charitable functions, and non-profit organizations. To receive your 10% discount Contact Us to let us know about your cause or charity. You can also submit your request to info@aavalet.net. AA Valet, Inc. can customize EVERY detail of your event from a custom sign (including your logo or monogram) up to the uniform the valets wear.